Within Acourate, there are many options available in crossover design. 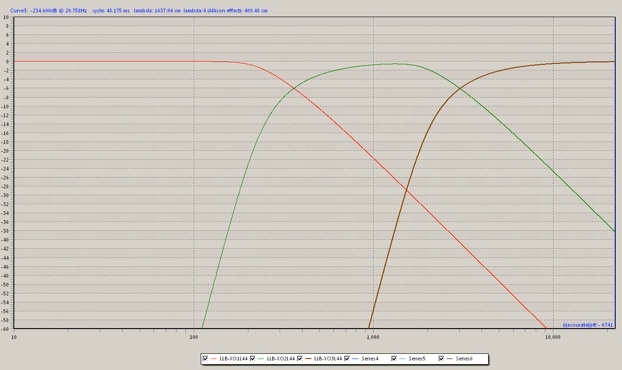 If you read the basic theory put up by Uli, it doesn’t matter what you use and the crossover will still be linear phase with no pre or post-ringing. 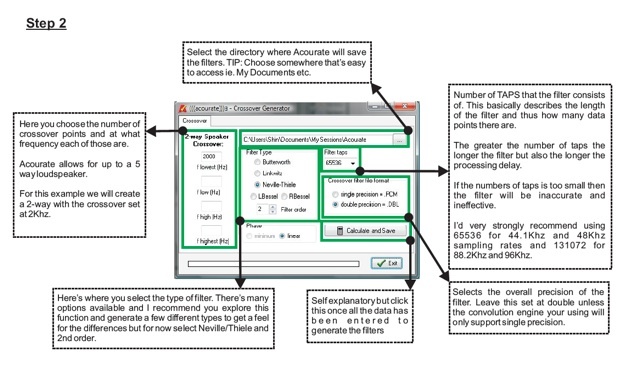 But Bessels filters is by design linear and minimizing the need of Acourate to do the job. So I thought that would be a good one to start with. Based on the drivers characteristics, this XO frequency is what I have chosen. Sub: below 50Hz to run with the woofer. 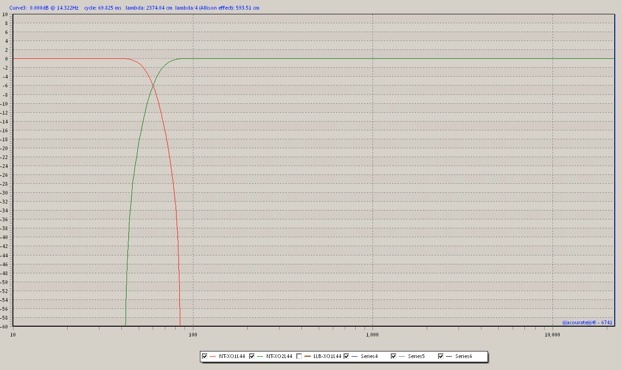 If you follow the white paper by Uli, you will remember that Bessel filter, by design, is a linear phase filter and do not introduce pre-ringing and post-ringing. 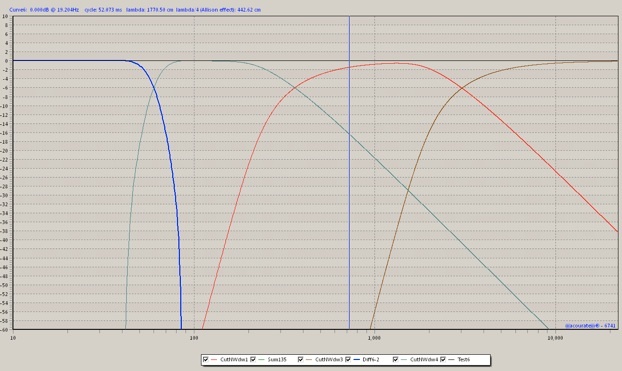 More information about Bessel filter can be found here and here. Since my setup is more than just a simple 3-ways set up, the XO design is a bit complicated. First, by selecting the setting as shown above, I created a standard 3-ways XO. The sub will overlap the woofer at the very low frequency to about 40Hz. 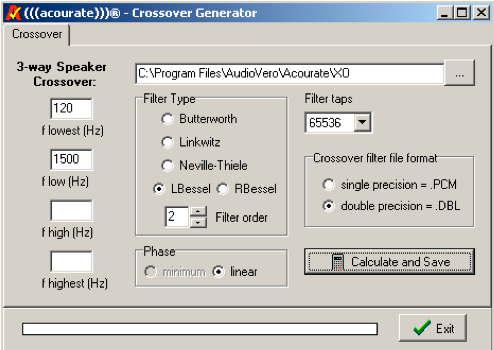 In order to do that I have generated a crossover just for the sub, applied gain factor of 0.3 (attenuate to 30%). 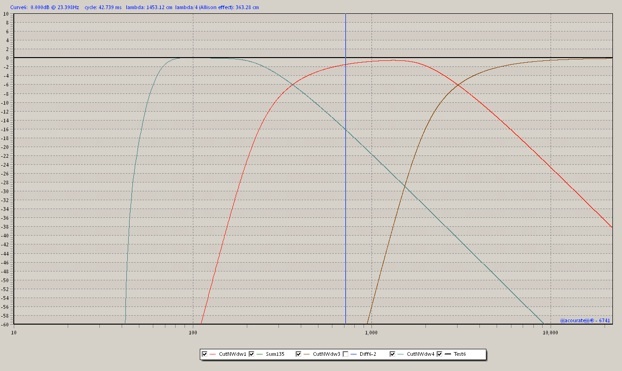 Then I subtract the woofer XO using TD-function from the sub XO. This way, I can be sure that the two added up to 100%. Here is the end result. You can see that The first 4 XOs added up to a flat line. 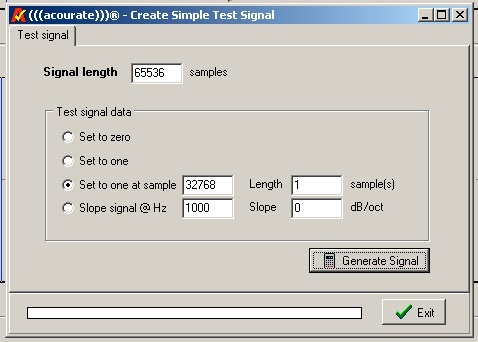 Now lets have a look at the step response. Perfect step response with the summation! Now this is the ideal crossover design. It is also the first trial. Since the sub is placed right against the wall, it tends to excite all the room modes and causes over exaggerated response. 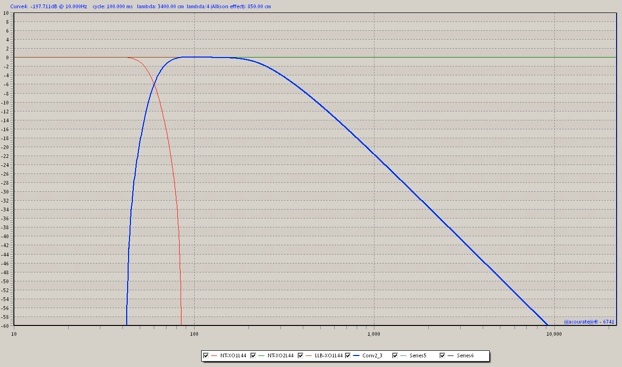 The choice of applying 0.3 gain factor is only arbitrary, depending the measured response, I will make adjustment later. As you can see, using (((Acourate))), we can achieve something ideal by design. I will show you how this design turns out in real world. 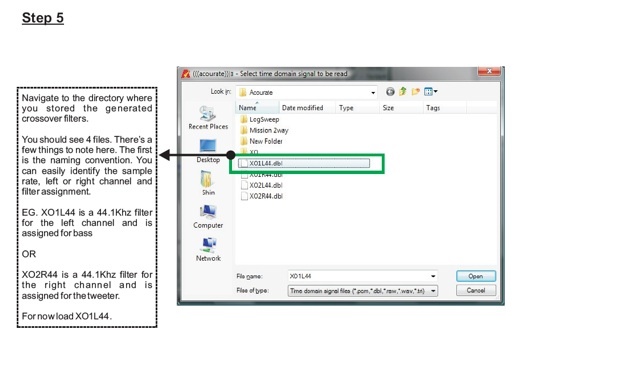 Here are the steps involved in details presented by ShinObwian. 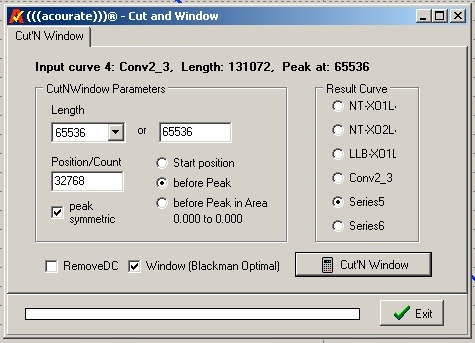 Creation of crossover with different type, different slope. 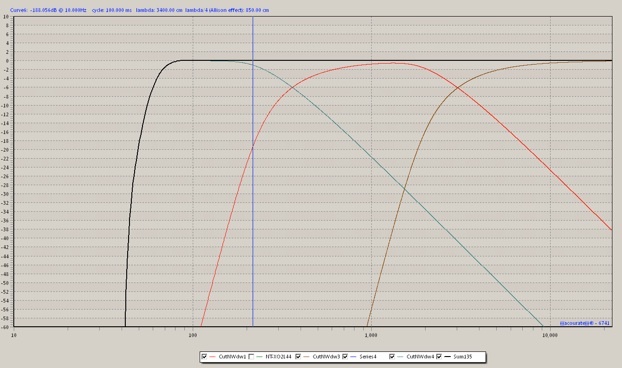 After playing the Bessels crossover filter for over 6 months, I have noticed that it does give a very transparent and clean sound, probably due to its linear phase properties. I can hear all the details in the recordings, the transient is excellent with short decay, there is no residual in the mid air. However, the downside is that it makes the music dry. The mid bass and bass is rather thin. In other words, it sounds dull and each individual piece of instrument can be clear heard in a very defined space but they seem to be separated from each other and there is a lack of coherence in orchestral work. I can see the potential of Bessels filters in a wet room as everything will com alive. In my room, it sound rather dull. Compared to LR filters, I have noticed that the transient is not as good. Each percussion is not as precise in terms of imaging. But LR is more airy, the bass is stronger probably due to slower decay of each note. The orchestral work is more coherent and more life like.